“Space isn’t remote at all. It’s only an hour’s drive away if your car could go straight upwards.” – Sir Fred Hoyle. While space itself may not be very far away, it’s so big that things can take a long time to get from one point of space to another, as is emphasized in this story. This manga adaptation of the short film by Makoto Shinkai (who is probably best known for Your Name) deals with the problems caused in communication in space. Set in 2046, it follows the relationship between Mikako Nagamine, a girl who has just been recruited into the UN’s Space Army; and Noboru Terao, the classmate she has left behind. Before she left, they were falling in love, but now she is piloting a Tracer mecha as the Earth is fighting in a war against the Tharsis aliens. The two try to keep in touch with each other by sending messages on their phones, but the problem is that the further Mikako travels into space, the longer it takes to transmit the messages. By the time she gets to the Oort cloud on the edge of the Solar System the messages take over a year to get through, and when she finally goes to a planet orbiting Sirius, the messages take eight years. Noboru thus begins to wonder if she is contacting him at all, and whether the two are still in love. Voices of a Distant Star deals with ideas that have a basis in solid fact, such as the length of time messages would take to arrive, and puts this at the heart of the relationship between the two main characters. Obviously, as this is a sci-fi story, certain things have to be created in order to make that story work, such as wrapping technology being developed that allows the Tracers to travel vast distances quickly, and thus creates the long distance that’s required to make the story work. Despite this, there are signs that this sci-fi tale is rather dated. Namely, in the style of phones they are using. The original anime was made back in 2002, this manga in 2005, and thus smartphones hadn’t come about. So despite this story being set in the mid-21st century, the phones they use look like old-fashioned Nokias. In terms of the other aspects of the art, Mizu Sahara’s work has some high points, mainly with the character design, and the colour pages in the book are great. The backgrounds seems a bit lacking in detail as do the mecha designs, but the characters help make up for it. However, the outdated phone technology is only a minor detail. In terms of the story, it is a nice tale of long-distance lovers, separated by light years. In terms of the plot concerning the effects of time dilation between two people, Distant Star is by no means the first to deal with it. 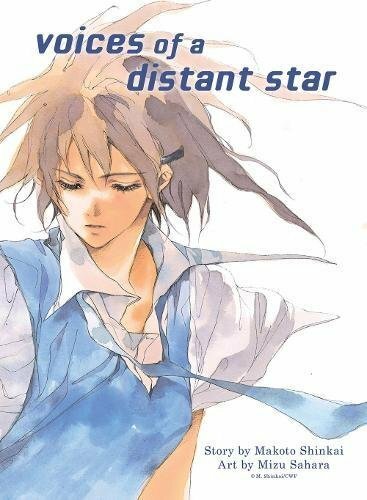 Hideaki Anno’s Gunbuster dealt with similar ideas back in the 1980s, but Distant Star is more concerned with the relationship between Mikako and Noboru. It is a charming, and sometimes tragic tale about two people whom you worry will never be able to meet each other again.